Macedonia Thracia, Illyricum and the Provinces on the Middle and Lower Danube. 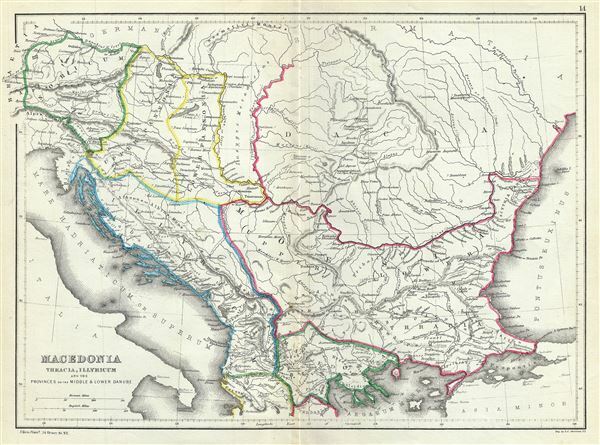 This is an attractive 1867 map of Macedonia and the Balkans in antiquity by William Hughes. The map depicts Macedonia, Thrace, Illyricum and the provinces on the middle and lower Danube, covering parts of modern day Greece, Macedonia, Albania, Montenegro, Bosnia and Herzegovina, Croatia, Serbia, Bulgaria, Romania, Slovenia and Turkey. This map was created by William Hughes, printed by J. Bien and engraved by G.E. Sherman, for issued as plate 14 in Sheldon and Company's An Atlas of Classical Geography.